The HTC One (M8) will be available in Singapore from this Saturday, 5th April 2014 at all mobile operators (SingTel, M1 & StarHub) and authorized retailers. Two colors will be available, Gunmetal Gray and Glacial Silver. The recommended retail price (RRP) is S$998 for the 16GB HTC One (M8). If you are going to get the HTC One (M8), make sure you get the HTC Dot View case as well as that is what makes the HTC One (M8) unique. The case will be retailing for S$59 and the availability will be announced at a later date. Checkout the press release below, it got a pretty good introduction to the new features in the HTC One (M8). Singapore, March 31, 2014 – HTC, a global leader in innovation and design, today launches in Singapore the highly anticipated new HTC One (M8), the ultimate evolution of the award-winning HTC One (M7). Launching in Gunmetal Gray with the all-new HTC Sense 6, the new HTC One (M8), boasts a high quality metal unibody with a Smart Sensor Hub that anticipates your needs and uses Motion Launch controls to make everyday tasks easier. New Duo Camera technology delivers creative, professional-looking photos and amazing effects, and HTC BoomSound again sets new standards for audio quality on a smartphone. Achieving another breakthrough in design and quality with the new HTC One (M8), the phone’s body has been re-crafted to create an even more stunning yet approachable look. The beautiful, durable, high quality metal unibody flows right up to the 5-inch, full HD (1080p) display, tapering to thinner edges, with softer curves for a smooth, more natural grip. Supported by the Qualcomm Snapdragon 801 processor with 2.5 GHz quad-core Krait CPUs and fully integrated 4G LTE, and running Android 4.4, KitKat, the latest version of the Android OS, the new HTC One (M8) features the all-new HTC Sense 6, available on the device and as an upgrade from the Google Play store. Completely redesigned with a cleaner, more striking visual style, HTC Sense 6 features bold, customisable color themes and delivers a more intuitive, personalised user experience. The new HTC One (M8) brings a totally different dimension to mobile imaging by combining the world’s first smartphone with a Duo Camera that features HTC’s innovative HTC UltraPixel module, a dual color flash and full 1080p HD video recording, producing incredible images in all lighting conditions and rich, high-quality video. A 5-MP wide-angle front facing camera also captures superior selfies with ease. The Duo Camera boasts a depth sensor in addition to the main HTC UltraPixel module, capturing detailed depth information from a scene and enabling a range of beautiful and creative effects that allow you to do more with your images than ever before. Instantly create professional-looking portraits by altering the focus of your image after the photo has been taken with UFocus or make your subject stand out in a more surprising way by altering the background with creative effects using Foregrounder. You can also give your best shots a seasonal flavour using the Seasons animations. Copy & Paste lets you place your family and friends in a different photo entirely, while Dimension Plus presents a unique perspective on your photos by letting you view your image from a different angle by simply tilting the screen. The advanced camera technology also works behind-the-scenes capturing images right from launch, so that when the shutter is activated, the sharpest possible image is instantly displayed. The camera autofocus operates at a speed of 300mseconds, producing beautifully crisp images of split-second action and when the flash is required, the intelligent LED Dual Flash automatically selects the exact color tone and light intensity for more natural skin tones and a professional-looking shot. With so much scope to create exciting imagery, Gallery organisation has also been a priority for the designers of HTC Sense, who have introduced Image Match, a visual search tool that intuitively moves all the photos containing a particular subject into one album. Finally the new HTC One (M8) has also integrated Slow Motion mode, which lets you shoot HD slo-mo video and then edit that video so you can slow down the action at the part you want – perfect for adding drama or for highlighting a moment. In 2014, Zoe will evolve into a cloud-based service. Upload Zoe Videos for all to see, and invite friends to add their own photos, videos and music to share incredible highlight reels of classic moments. The new Zoe app will be available for download through Google Play in the summer. With the introduction of HTC Sense 6, the new HTC One (M8) boasts capabilities that give the product a sixth sense. For example, Motion Launch is immediately able to detect its position and movement, thanks to built-in motion sensors that allow you to interact with the phone without turning on the screen. A simple swipe will activate the device, Auto Answer allows you to answer a call by putting the phone to your ear without touching the screen – a handy tool if the phone rings when you are digging the garden or washing the dishes – and a double tap turns the lock screen on and off. Taking that sixth sense functionality one step further, you can extend Motion Launch by double tapping the Dot View case, in addition to checking the time, weather, new texts, emails and calls – without touching or revealing the screen. An outstanding phone deserves a case that protects and extends its innovative design and industry-leading functionality. 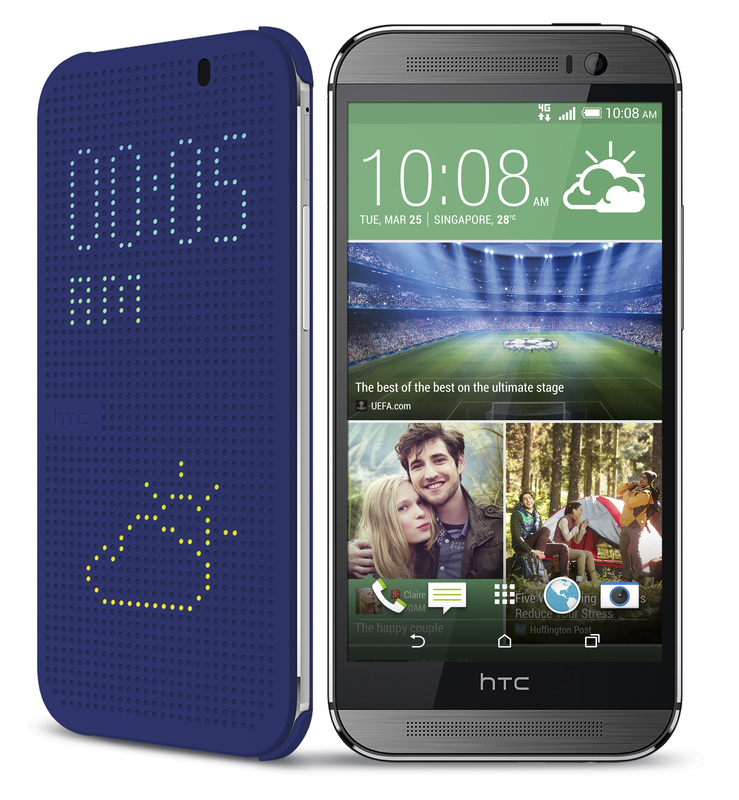 Optimised by HTC Sense 6, the new HTC Dot View phone case protects the screen, whilst displaying notifications and interactions in a retro, dot-matrix style. The innovation doesn’t end there, as we are also changing how people use their phone battery. With the original HTC One (M7), HTC optimised power consumption so that you could get the most out of your phone. The new HTC One (M8) takes this to a whole new level making the battery power last 40% longer. Whilst normal power saving mode delivers a great experience, we have also included an Extreme Power Saving Mode that makes your battery last even longer. Fully charged, it will deliver 14 days’ worth of battery power, whilst still allowing you to receive calls, texts and emails – perfect for when you are travelling. Activated either manually or automatically, it delivers 60 hours of extra standby time at 20% power, 30 hours at 10% power and 15 hours at 5% power so, whether you are out late at night or hiking in the mountains, you never have to worry about running out of battery again. The new HTC One (M8) again takes the smartphone audio experience to new heights. The latest HTC BoomSound technology creates an immersive, powerful, crystal-clear sound with rich tones from bass through to treble. Delivering sound that is 25% louder than the HTC One (M7), without compromising quality, the new HTC One (M8) has dual frontal stereo speakers with a new amplifier, redesigned speaker chambers and a tailored audio profile for a truly high definition experience. HTC BlinkFeed is now more intuitive, with continuous scrolling for a fluid browsing experience, adaptable tiles and a new layout that presents articles in a clean, easy-to-read way. With the introduction of a new SDK that allows partners to integrate their own content, users can more easily find and subscribe to new media sources, in addition to instantly creating custom feeds on any topic. So whether you are into sports, movies or shopping, this feature ensures that that you will get the information most relevant to you. With News Bundles that bring all articles and tweets on the same topic together for easy reading and over 1000+ content partners now clearly categorised on one page, following the most interesting news couldn’t be simpler. With the new HTC One (M8), you can get healthier and stay motivated by combining its power-saving sensor hub with the preloaded Fitbit app. Alternatively, use the phone in conjunction with one of Fitbit’s range of trackers to access advanced features such as sleep tracking and smart alarm or to capture data when exercising without your phone. Set your fitness goals and see your achievements brought straight to your HTC BlinkFeed home screen with no additional effort. Fitbit is the top downloaded app for connected fitness devices on the Google Play store. The only remote you need on the new HTC One (M8) has been redesigned to provide an interactive second screen. You can follow the conversation about the programme online with integrated official Facebook and Twitter streams along with all the latest fan commentary from your social circles. HTC Sense TV now also brings live sports statistics for the 10 most popular sports in the world, with sports fans now able to access the latest scores, match statistics and live updates from unmissable games while they watch another game on the main TV screen. 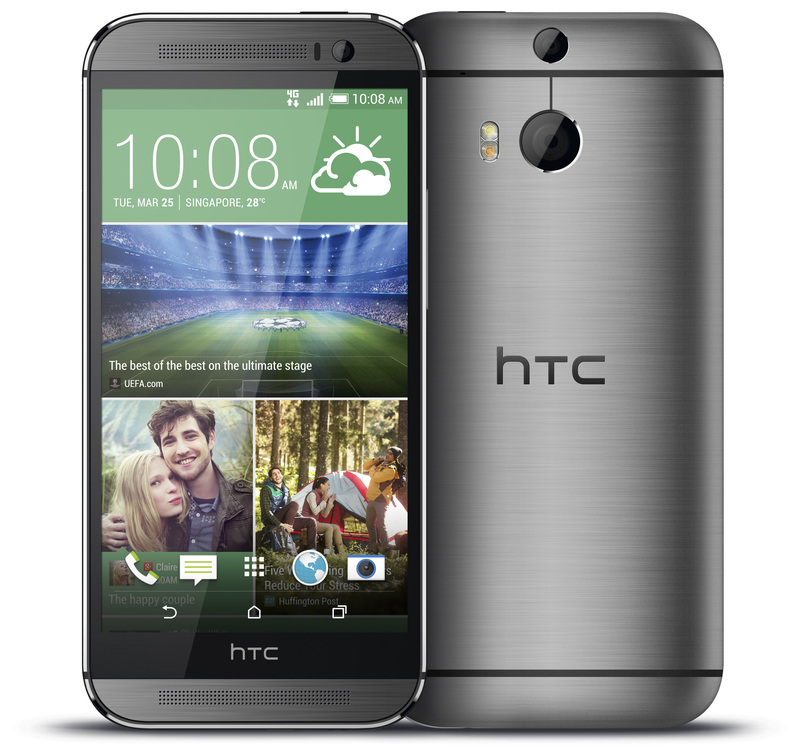 The HTC One (M8) will be available in Singapore at all mobile operators and authorized retailers in Gunmetal Gray and Glacial Silver, beginning April 5, 2014. This page is generated on 22nd April 2019, 09:50:03 (UTC) in 0.281s with 17 queries using 4.0 MiB of memory.